I’m lying inside a giant box. No, that’s not some weird metaphor. I am literally lying inside a giant box. Why? Because when our new fridge arrived the other day, my first thought was, “Charlie’s going to love this box.” And yep, I was right. Now I’m lying inside the giant box as she sleeps sweetly, cuddled into me because, “Mama sleep in box, please,” completely melted my heart. And when your daughter melts your heart. You just can’t say no. So, as I lie here (at 03:35 am because apparently, my body doesn’t like sleep) I am thinking about the box and why I thought of Charlie when most adults would be excited about the new fridge. (Is it that my brain is now incapable of thinking about anything beyond Charlie? Possible). But then I remembered…Boxing Daria. For those unfamiliar, Daria was an animated show in the 90s–created by Glenn Eichler and Susie Lewis–and for me, undeniably the best show ever created. Now don’t get confused, animated, yes–but certainly not your typical cutesy, Disney variety (I LOVE those too!). Daria was produced by MTV for a teen audience and it had all your typical teen angsty goodness with a touch of humor. It also spawned my love of satire. In the “Boxing Daria” episode, she finds comfort in a refrigerator box during a difficult time in her early years (thus, me lying in a giant box with my kid). It’s 06:00 am now and I’m reminiscing about a cartoon (I can almost feel your eye roll…get to the point already). Anyway, so it got me thinking…Daria was socially awkward, completely pessimistic and wasn’t always pleasant to her peers. She was an outlier, yet despite all that, she remained true to herself and it made her resilient. At the end of the day, this is really all I want for Charlie. I’m excited to watch Daria with Charlie (I mean when she’s 12). 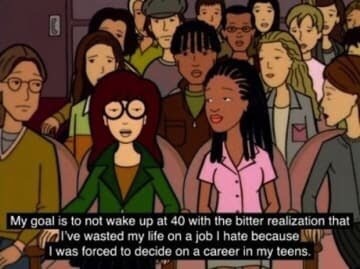 It will probably seem so ancient to her by that time, but considering my values are still the same…perhaps, Daria was onto something way back in the 90s. Case in point, there is so much truth to this response to a question about her goals in life. Great tips on monitoring your child’s screen time by Dr. Alan Kazdin.